Imagine my surprise on arriving in France and observing this behavior at table, whether at family occasions or in restaurants. Perfectly polite-looking people with linen napkins lightly placed on laps, tearing off bits of bread and delicately dabbing or swiping their plates, then popping the sauce-laden bread to bouche. In Italy, perhaps, this would have seemed normal. In France, it appeared indelicate. But in this, as in so many aspects of French life, my expectations were off. ‘Saucer’ means to mop up the sauce on your plate with bread. Although not considered perfect etiquette, it is accepted behavior at table in France. And a compliment to the chef. Let’s face it: French cuisine provides ample motive and opportunity to ‘saucer.’ Everything from the humble vinaigrette to the delicately rich blanquette de veau leaves you with a puddle of liquid on your plate crying out to be consumed. And the bread stands by in waiting, a natural sponge and perfect vehicle for the task. Even in more formal settings, there is a perfectly polite way of pulling this off. 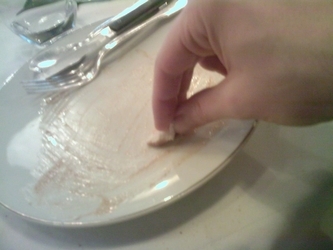 It consists in putting a small piece of bread on one’s plate and using a fork to perform the mopping. While they value ‘la politesse,‘ the French are practical souls who see the value of not letting a wonderful sauce go to waste. And manners, in my book, are all about consideration for others. ‘Saucer’ is considerate on every count: offering compliments to the chef, cleaner plates for the kitchen crew, and no wasted bread! How about you: do you mop or ‘sauce’ your plate? For French speakers, here’s a thorough run down on correct behavior at table. *Although I do remember scenes of plates being licked, to my mother’s eternal horror, on spaghetti night!